Joyce Totten, 86, of Elgin, passed away peacefully on June 26, 2018 surrounded by family. 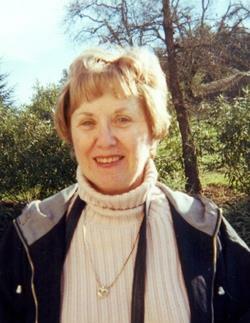 Joyce received her Associates Degree from Centenary College and later worked as a secretary at Hoffman Estates High School for 20 years. She was active in the Leukemia League and ROOST. Her passions included traveling, playing cards, watching the Chicago Cubs and Bulls and eating Oreos. She also loved enjoying life with family and friends. Joyce was born the daughter of Spencer and Johanna Anderson on May 2, 1932 in Ridgewood, New Jersey. She attended Ridgewood High School in New Jersey. While in high school, she met her husband of 63 years, Donald Totten. They married in 1955 had four children. She believed her greatest accomplishment in life to be her three children; Diane, Rob and Kathy and looks forward to being reunited with her first child, Donna, who was lost to Leukemia at the age of 7. She is survived by her husband Donald, her children Diane Faldstein of Mooresville, NC, Robert (Cyndi) Totten of Jacksonville, FL, Kathy (Mike) Weber of Cornelius, NC and grandchildren Brett Faldstein, Ericka Faldstein, Kyle Weber, Jennifer Totten, Alex Weber, Danny Totten, and Brian Totten, and great grandson Joshua Brady. She was preceded in death by her parents Spencer and Johanna Anderson, sister Virginia Kiesel and daughter Donna Totten. Visitation Saturday, June 30th from 9:30 until the time of service at 11:30 at Ahlgrim and Sons Funeral Home, 330 W. Golf Road, Schaumburg. Memorial donations in her honor may be made to the American Stroke Association or Breast Cancer Society. Funeral information or online condolences www.ahlgrimfuneral.com or 847-882-5580.